See those leftovers? That was last nights dinner and today’s lunch. Some meals are just like that; as soon as you put down your fork after the first go-round, you’re already looking forward to the leftovers. I admit to making certain things for dinner just because I love the leftovers so much- bizarre, no? I didn’t know this recipe was going to be one of those, but after one dinner and one lunch, I’m already hooked. I came across this Spicy Chickpea Stew while browsing The Kitchn‘s archives one bored afternoon. 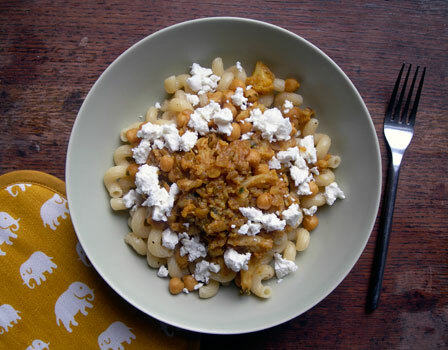 A guest post from Michael of the blog Herbivoracious, it caught my eye primarily because it uses two ingredients that I love eating, but am constantly struggling to get excited about cooking: cauliflower and chickpeas. This “stew” (more like a curry, really) is made by simmering roast cauliflower florets in a mixture of onion, spices, and chickpeas. The flavour is slightly different from my usual curries, in that it includes a healthy dose of cinnamon (yum!) and fennel seeds (not usually a favourite of mine, but they work here). Last night, I served this over brown rice with a dollop of Greek yogurt on the side. As delicious as it was, Andrew still felt that there was something missing. 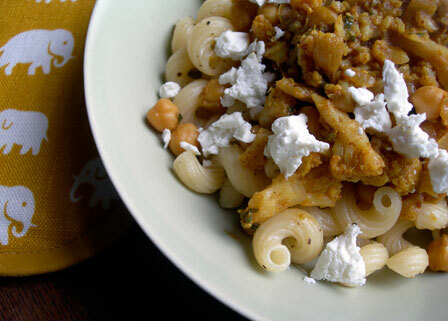 I think I hit on the right formula for my lunch today, though: served over pasta and sprinkled with cold feta cheese. But don’t think I’ll be letting him in on this discovery- more leftovers for me, this way. Meanwhile, heat the remaining 2 tablespoons of olive oil in a large non-stick saucepan and add the onion. Cook for 8-10 minutes over medium heat until soft and golden. Add the garlic and tomato paste and continue cooking for another minute or two, then add the remaining cumin, the turmeric, cinnamon, fennel seeds and cayenne. Cook for about 30 seconds until the spices are very fragrant. Add the chickpeas, lemon juice and about one cup of water. Cover and simmer over low heat until the cauliflower are done; when they are, add to the pan and bring everything to a low boil. Using a potato masher or the back of a wooden spoon, try to crush some of the chickpeas and cauliflower to thicken the sauce- you may need to add more water to achieve a “stew-like” consistency. Season to taste with salt and black pepper, then serve over rice, couscous or pasta. Sprinkle the coriander and feta over the top. Yep. Can eat this kind of thing all day long and the next day too. Good for you for getting creative with it! This has me really hungry. This dish looks great! I like your elephant pot-holder too! Where’s the potholder from? Sweet! Dana- I’m glad I did- this is great with the feta. This definitely looks like something I’d love, especially with the feta! Kalyn- I love feta on just about anything. It’s just one of those magic ingredients, isn’t it? not bizarre AT ALL. I love leftovers! I double everything up for this very reason. Looks great! The first recipe looks so good. I think I will try that recipe. i am in love with this recipe. this is the gazillionth time i’ve made it (switching curry with allspice+cumin and amping up the tomato flavor with canned crushed tomatoes). Wow this looks delicious! I’m definitely going to make it!